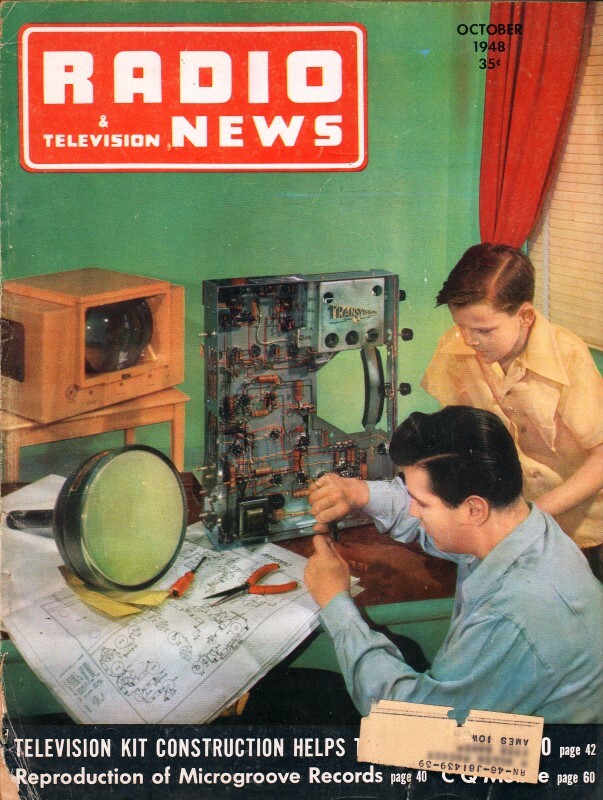 Before most people listened to radio and television programming via cable, satellite, and/or the Internet, broadcasts were received over the air, usually from local stations. A common problem in the days of vacuum tube Ham transmitters back in the day was inadvertently causing broadcast interference (BCI) or specifically in the case of television, TVI, due to insufficient filtering, shielding, or design. Nowadays, we generally refer to all such unintentional and incidental radiation as radio frequency interference (RFI). Lots of articles were written on the subject in the 1940s through about the 1970s. Some RF spectrum is shared by more than one entity per FCC and other countries' band plans, with primary and secondary allocations assigned for some. For example, in the U.S., the 33 cm amateur radio band coexists with the 902-928 MHz unlicensed Part 15 ISM (Industrial, Scientific, and Medical) band. Ditto for some of the other ISM bands. If you're not a Ham, you might be surprised to learn that licensed amateurs have primary rights to the band's use, and that any device operating under Part 15 is obligated by law to not interfere with amateur activities. If, for instance, you live in an apartment and your other-side-of-the-wall neighbor's cordless phone is spewing RFI that degrades your ability to operate, he/she/it is required to eliminate the problem. Both the ARRL and the FCC advise an amicable initial approach to said owner of interfering device in order to promote and preserve good community relations. Mac, his chin clasped thoughtfully between thumb and forefinger, stood looking down at Barney, his redheaded assistant. For five minutes that worthy had been prodding away at a soldered connection on the set in front of him with a soldering iron whose cord-plug still trailed on the floor at his feet. 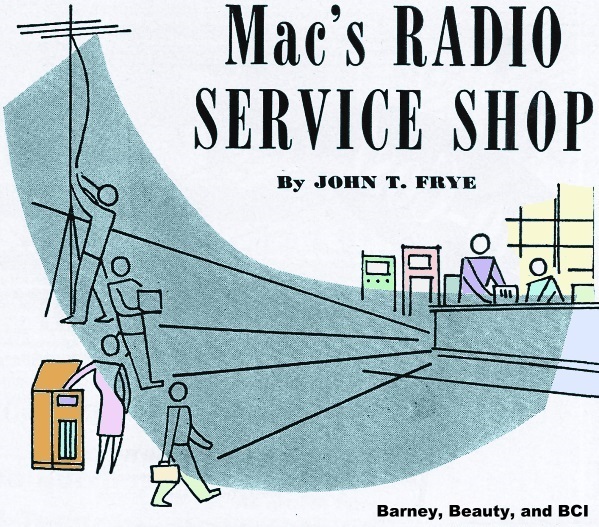 Stepping quietly to the door of the service department, Mac beckoned to Miss Perkins, the office force of Mac's Radio Service Shop. As the two stood there in the door watching Barney's continuing efforts to melt the solder with a stone-cold iron, the boy looked up, followed their amused gaze down to the plug that he had forgotten to put in, and then blushed furiously. "Matilda," Mac inquired,' "what would you say has come over our Barney?" "We-l-l-l," Miss Perkins replied, "it just might have something to do with that pretty girl I saw him walking to work with this morning." "Aw, it does not," Barney denied, if possible, blushing more furiously than ever. "That was just Margie, our new neighbor. Boy, was she mad at me last night!" "Pray tell us more," Mac urged. "Well, I was sitting there in the ham shack bumping my gums with a fellow down in the Canal Zone on ten meters, when all at once the final arced over, the circuit breakers kicked out, and Margie - I had never seen her before, because they just moved in two days ago - stuck her head in the open window and said that now perhaps she could listen to her 'Parade of Bands' program without having to put up with my going yackety-yackety right in the middle of it. She had taken a pair of pruning shears and had cut off the coax right where it comes through the wall on its way up to the beam," Barney explained admiringly. "After hearing you beef about your mother's daring to touch that beloved transmitter just to dust it, I have no doubt at all that you dived right through the window and cut the young lady's throat with the pruning shears," Mac guessed. "You can't get mad at anyone who looks as pretty as Margie does when her temper is up," Barney explained patiently; "and I was blanketing her little radio. After I managed to cool her down a bit, we went over and got the little set and ran some tests. When my rig is on, you can hear me and not much else. I told her I would see if I could not do something about that; so I brought the set down to the shop this morning. That's it on the end of the bench." Mac picked up the set, and Miss Perkins went back to her desk, explaining that if the conversation was going to descend to "just radio" she was no longer interested. "Did you notice if the volume control had any effect on the signal from your transmitter?" Mac asked. "Yes, when I turned the volume down, my signal disappeared." "Then I think you can take care of this case of interference very easily. Whenever you have a case of a signal, especially a high-frequency signal such as ten meters, coming in all over the broadcast band with equal volume for all settings of the tuning control, you can be pretty sure that you are getting rectification of the signal at some point in the audio system. In these little sets using zero-bias high gain triodes, like the 12SQ7, the rectification is taking place in the grid circuit of the triode." As he talked, Mac sketched Fig. 1 on the blackboard at the end of the bench. "R1 is often as high as ten megohms," he explained. "If very much of your ten meter signal appears on the grid of the tube, it is rectified and flows to ground through R1. This biases the tube so that it operates on the 'detector-portion' of the curve, and your high-gain audio amplifier has become a good grid-leak detector that causes your ten meter signal to ride right in along with the regular signal being delivered by the i.f. channel." "Couldn't that happen in the grid circuit of any tube?" "Yes, but it usually happens in the very first audio stage for that is where you find the high-resistance grid resistor. I am sure it is there in this case, for you say that you can cut out your signal with the volume control. What actually happens is that when you move the slider of the volume control toward the ground, C2 bypasses your ten meter r.f. to ground. Incidentally, that gives us our clue as to how to effect a cure. That is simply to install C1 directly from the grid to ground. The capacity is around 250 μμfd. - enough to furnish a low-impedance path for the r.f. without being large enough to bypass any of the higher audio frequencies." "Are there any other ways of doing the same thing?" "Yes, you could lower the value of R1 but that disturbs, in some degree, the efficiency of the triode amplifier. You can insert a small r.f. choke coil in the grid lead, or you can put a resistor of around 100,000 ohms right from the grid to the leads going to it; but I have found the use of the condenser the cheapest and most effective. I have, though; used the r.f. choke coil with gridcap tubes where it is not convenient to employ a condenser." "When I work seventy-five meters, I notice that I can pick up my signal at two or three spots on the broadcast band. We call this 'image reception,' but to tell you the truth, I have never had a very clear idea of just what was happening." 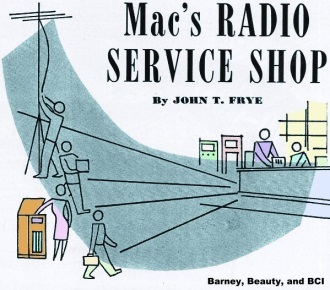 Before answering, Mac attached his signal generator to the antenna and ground connections of the set on the bench and turned both on. "First, we set the signal generator and the receiver both to 1300 kc.," he explained. "Now can you tell me at what frequency the oscillator is operating in this set with a 456 kc. i.f.?" "Just 456 kc. higher, or 1756 kc.," Barney said promptly. "That's right. Suppose we move the , signal generator to a frequency 456 kc. higher than that, or to 2212 kc. The beat between this frequency and the oscillator - the difference beat, that is - will be 456 kc., exactly the same as when the signal from the generator was on the low side of the oscillator frequency. We will have to increase the output of the signal generator to get a signal through, for the tuned circuit in the grid circuit of the mixer tube is tuned to 1300 kc. ; but if the signal is strong enough, it will force its way through." To demonstrate this, Mac increased the output of the service generator, and the 400 cycle modulation came through just as strongly as it had when the generator was set to the receiver's 1300 kc. frequency. "But I was not operating anywhere near 2212 kc.," Barney pointed out. "You will remember that you said the oscillator was operating on 1756 kc. The second harmonic of that is 3512 kc. Now if your transmitter were operating on the phone frequency of 3968 kilocycles, the difference between the frequency of your transmitter and that of the second harmonic of the receiver's oscillator will be 456 kc., which will slip right through the i.f. channel along with any other signal being received and make it sound exactly as though you were operating in the broadcast band." Once more Mac proved his point by setting the signal generator to 3968 kilocycles and producing a good strong signal in the receiver that had never been moved from its 1300 kc. setting. "You can take a pencil and paper and figure out that various harmonics of the receiver's oscillator can combine with a signal in the 3500-4000 kc. band-falling either 456 kc. above or below that signal - and produce a difference beat that will be accepted by the i.f. channel. That is why you can hear your amateur signal at various spots in the broadcast band." "How do I get rid of these images." "If the set is well-shielded and employs an outside antenna, wave-traps of either the parallel-tuned or the series-tuned type inserted in the antenna lead right at the receiver will usually get rid of the images in good shape, as long as the transmitter is not moved in frequency very far from the frequency to which the traps are resonated; but if the set employs a loop antenna in which the loop is really the r.f. coil. as this one does, that is something else again. Anything you try to no to keep your seventy-five meter signal from reaching the grid of the mixer tube is nearly certain to upset the tracking of the tuned circuit. "Sometimes the signal gets into the mixer tube by way of the light line rather than through the antenna circuit, and you can help these sets a lot by bypassing the filament leads to ground right at the mixer-tube socket. Quite often the best solution to the image type of interference - especially in a heavily populated neighborhood - is to select a frequency that will not allow the images to fall on any popular broadcast in that vicinity." With this, Mac went back to work. Barney put in a 250 μμfd. condenser at the grid of the 12SQ7 tube as Mac had suggested, and he asked if he could get off a half hour early so that he could test out the broadcast-interference cure before Margie got home from work. He promised to report by telephone on the results. Mac stayed around the shop a few minutes past his usual closing time, and just as he was going out the door the telephone rang. "Mac," Barney said, "that condenser did the trick all right, but now I have to take it off." Barney's voice came back over the wire with a mixture of pride and embarrassment: "Margie says that now she wants to hear my voice." "Good night, Barney," Mac said softly as he gently replaced the receiver and went out of the shop grinning.